Halloween is just around the corner! Who else is ready for some trickertreats? Halloween is one of my favorite holidays to celebrate, even though I’ve had to scale way back on my creepy decorations since Garrett was born. He is a delicate little dude when it comes to scary things, so I try to avoid decorating the house with too much ghoulishness since I really love uninterrupted, scream-free sleep. Four year old nightmares are not cool. I had this sign that I bought at TJ Maxx a while back. I’ve never really used it for anything, but I decided it was the perfect size to write out the words from the sign in the Haunted Forest that Dorothy and company encountered along the yellow brick road. The Wizard of Oz has always been one of my favorite movies, so I played around with some fonts and came up with a way to glamorize the “I’d turn back if I were you” sign. Who else was totally creeped out by that scene as a kid? Yeah, me too. 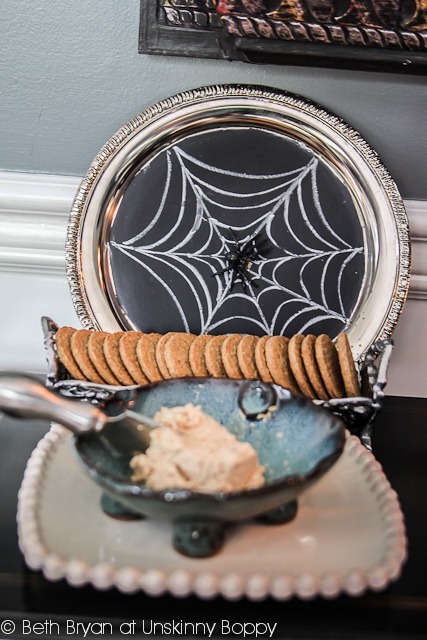 Now that we are grownups you can warn your party guests of all the haints lurking around your home by creating some fun Halloween chalk art with Krylon chalkboard paint. I knew there was no way that I could freehand this type of artwork, but I know from past mural drawing experience that a projection image is my best friend. I may not be able to draw with 100% accuracy but I can trace like a BOSS. The frames were standard Photoshop frames. After I had the graphic created I saved it as a jpeg, then I set up my projector, hooked it up to my laptop and traced the image right onto the board. If you don’t feel like going to all this trouble, keep reading. I’m giving away my graphics as a free printable at the bottom of this post! 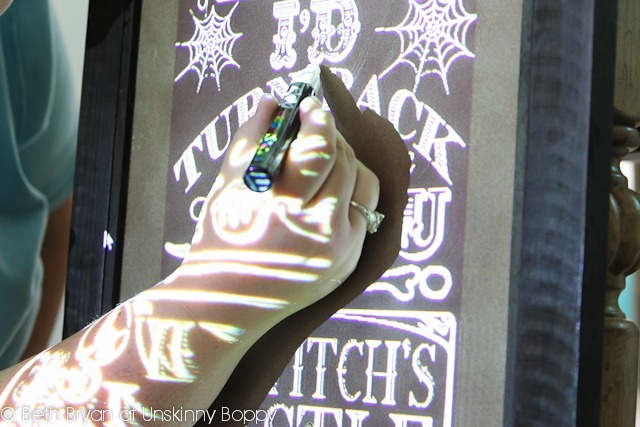 Then you just need a projector and you can make one of these bad boys for yourself. I used an EXPO Bright Sticks wet erase marker as my “chalk” for this one. Real chalk is just too squirrelly when you are going for tracing precision. 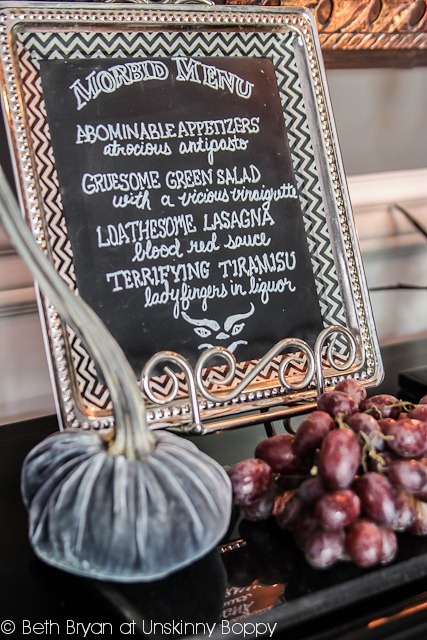 Once I had that piece of awesomeness created, I decided to go all out and create a devilish dinner party so I could make some matching pieces to go with the whole chalk art theme. I created a smaller menu board and another round chalk piece from old serving platters. That’s it! It was such an easy and fun way to add some life to these old serving platters that were bound for the trash. The circular one was perfect for a chalk spider web complete with a creepy fake spider. The Krylon chalkboard paint was a dream to use. It dried and hardened so fast that this was a quick and easy Halloween craft project. I’m now searching high and low for more things in my house that I can spray with chalkboard paint. Next up are labels for my pantry staples. Because salt and sugar sure do look a lot alike if you don’t have labels on them. The menu board was too small to trace, so I freehanded the font on this one. I never got straight A’s in handwriting, so this was more challenging for me than the big chalk art! I took my time and it turned out pretty well. I also spent a minute on thesaurus.com coming up with synonyms for the words “wicked” and “terrible” to use as adjectives for the food and gross descriptions. “Ladyfingers in Liquor” is my favorite. I love alliteration. 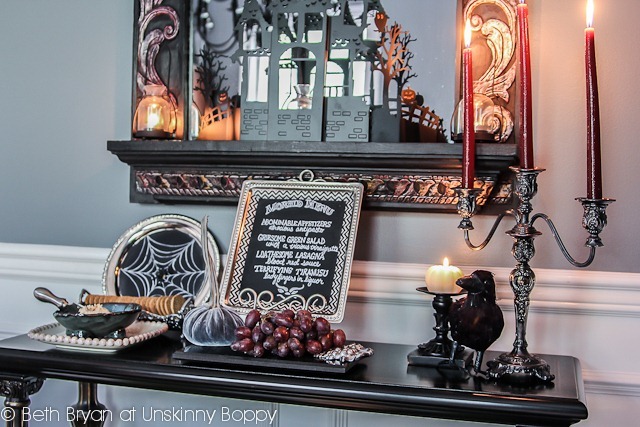 Lots of creepilicious touches like a silver candlestick with blood red candles, a black raven, a blue velvet pumpkin and my serving dishes make for a spooky sideboard. 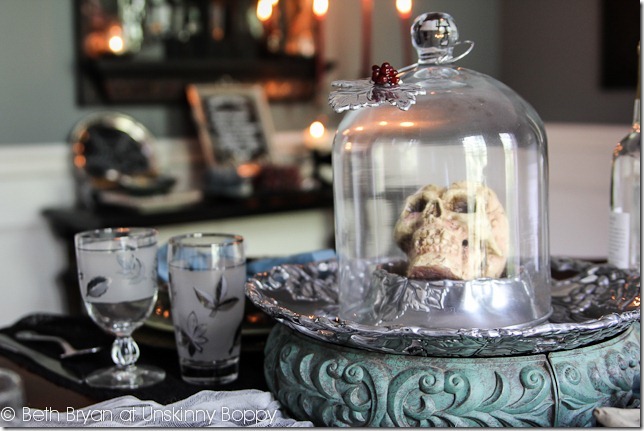 The terrifying tablescape was fun to create. Nothing like a human skull under a cloche to create the perfect halloween dinner party centerpiece. 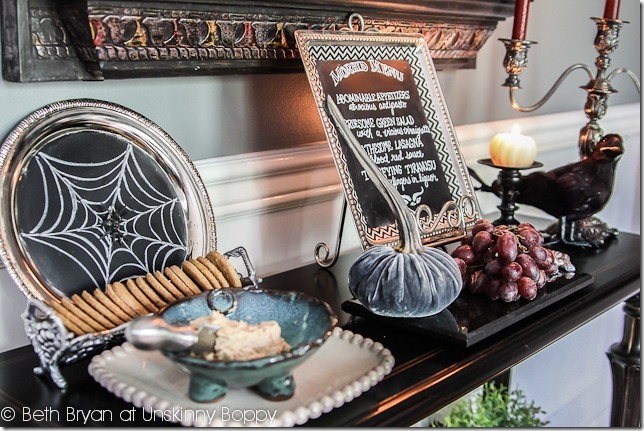 Instead of placemats I used black Halloween fabric and a ripped cheesecloth runner to create a ghostly effect on the table. 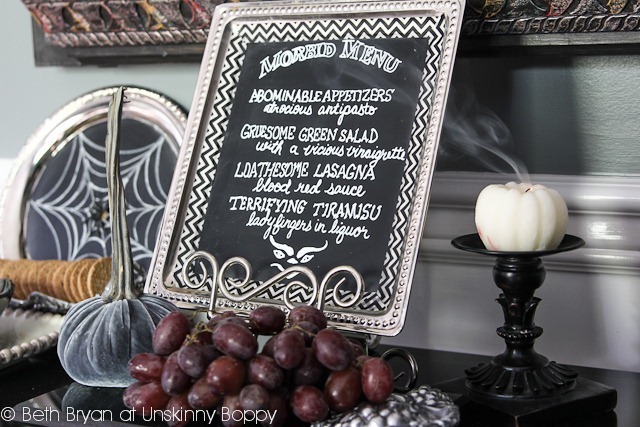 This devilish dinner party is ready for some undead guests. I do have to admit that as soon as these pics were made the skeletons got tossed back into the closet so Garrett wouldn’t have any night terrors of rattling bones in the dining room. 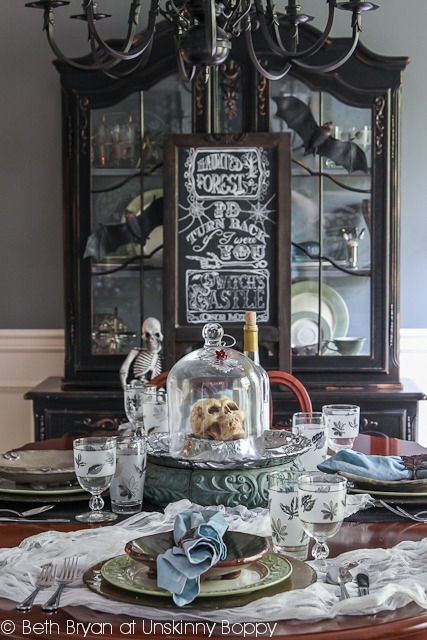 How’s that for the perfect Haunted Halloween tablescape? Since I love y’all so much I’m gonna share my design here as a free printable that you can download and use if you’d like. Here you go! Enjoy! Disclosure: I was creepily compensated for this spooktacular sponsored post and received some frighteningly free spray paint. The ferocious free printables are provided to my readers at no charge for personal use only. All photos, ideas, printables, goofy alliteration and opinions are 100% my own. « This is a test of the emergency line break system. 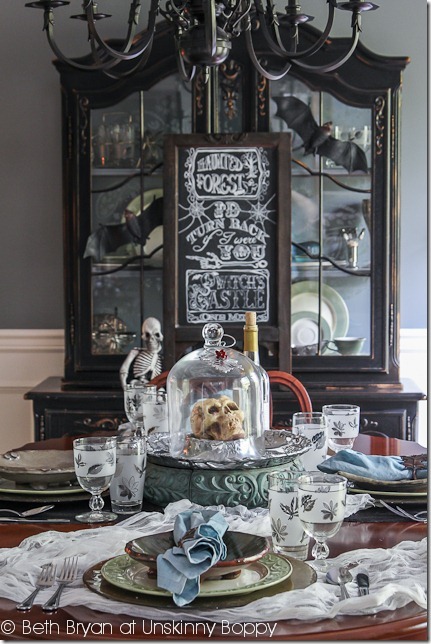 Chalkboard paint is magical – I may even consider it the 8th wonder of the world! And you are a true chalkboard artist – first your dining room, next stop the Met Museum! What time should I arrive for some of that terrifying tiramisu?! Your chalkboard projects are AMAZING! Great work! A WET ERASE marker – DOH! What i’ve been missing all my life! THANK YOU! Super cute and a great tutorial. Thanks for sharing. Wow Beth you are soooo good at chalkboard art, I’m envious! I’m going to have to look for one of those wet erase markers… hmmm.. This is sooo cool!! YOu did Krylon proud! A projector?? DOH! What a great idea! 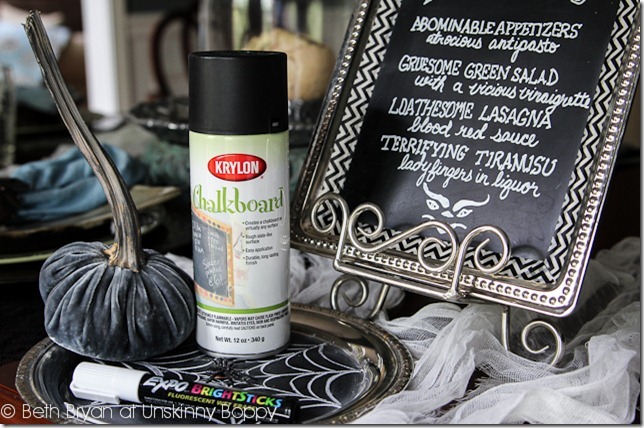 OK, now I’ve got the itch to go and try something funky on my big giant chalkboard! LOLLL – Because salt and sugar sure do look a lot alike if you don’t have labels on them. You crack me up! And amaze me, these looks AWESOME! I love it! 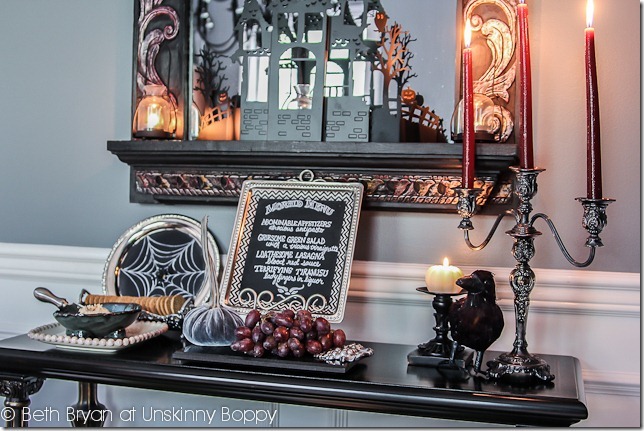 Love how easy this project is, and the grueling appearance it makes- perfect spooky Halloween fun! Thank you for sharing…great idea!! When I saw your sneak peek. I KNEW it was going to be good but this is GREAT! Wow girl, you brought it. Love the entire post and the entire look you put together. I read every word. It’s awesome!!!! Wow, Beth! Awesome job! I read every word. lol – but the pictures/your projects are super cool! Thanks so much for sharing! Oh my gosh Beth! This project is so frightening fantastic! I had no idea those markers existed. 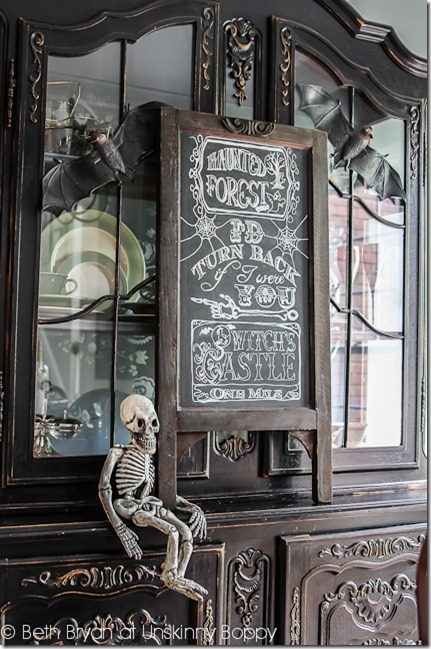 I have a chalkboard in the kitchen, so I may try my hand at something similar. Thanks for making the printable available. These turned out so cute Beth!! Love them all!! You? Are amazing! I love love love this whole post!!! SUCH great ideas! It looks amazing! I love the big one with the chalk art!!!! You did an awesome job!!! BEYOND AMAZING! I need a projector in my life! The sign turned out so creepy cool! Love it!!!! Holy Moly!! 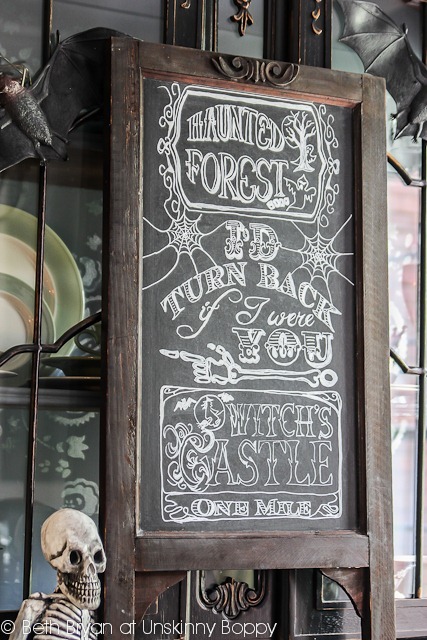 This chalkboard design is amazing. I’m going to have to step up my chalking game! Great job and loving your blog! Now I have to go find how to become a follower! This is so beautiful? What projector did you use? Is there a decent inexpensive one you would recommend? Oh, Beth, that’s fantastic! I’m debating whether I’m feeling more inspired to host a Halloween party or come crash yours!! What a fun take on the chalkboard trend. Love your chalkboard art and writings! 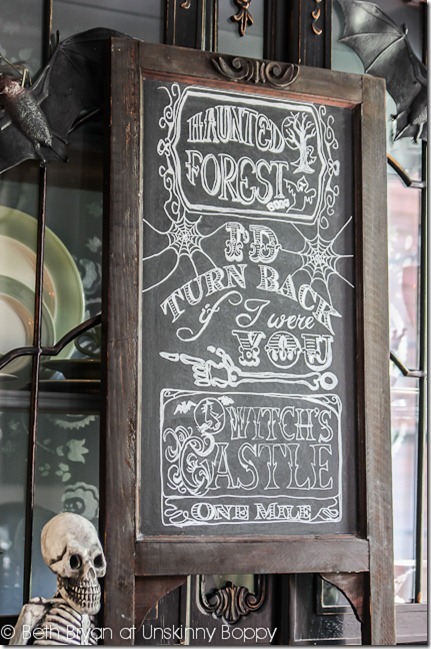 I just posted about my Halloween chalkboard today..
Not nearly as fancy but still so fun! 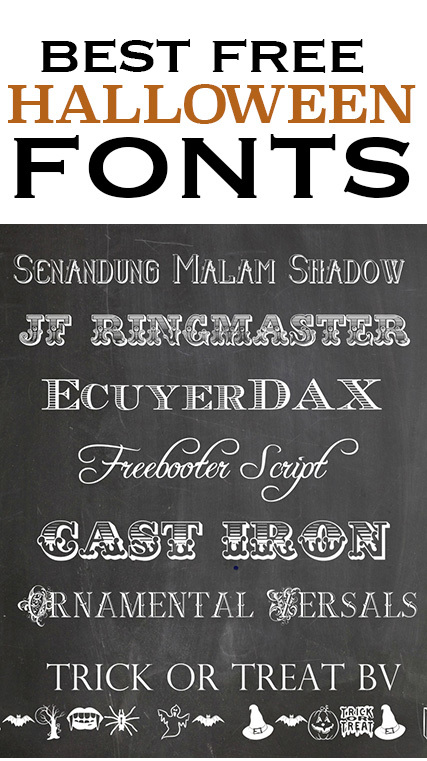 Thanks for sharing and the tips on fonts for future chalkboard masterpieces! Very cool, Beth! I may have to try this. I have a can of Krylon chalk spray paint in the garage. This would be the perfect use for it! I absolutely love this! I’m addicited to chalkboard art and I am definitely not an artist. Your chalkboards turned out great! I’m so inspired by this. 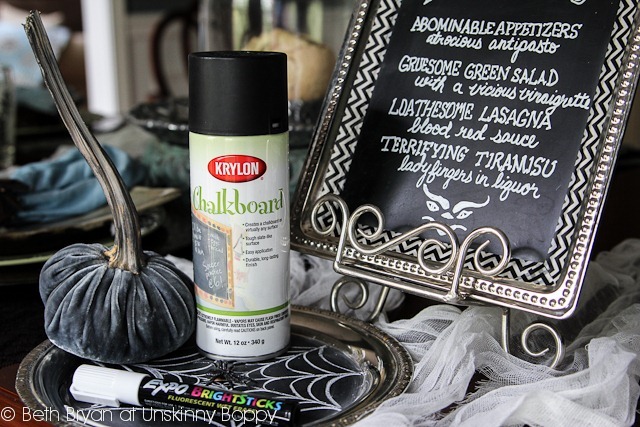 In fact, I already have a can of Krylon Chalkboard paint right here ready to paint something! Thanks for sharing. Visiting from Thistlewood Farms. Love your trays turned Halloween signs. I don’t know how I haven’t tried chalkboard spray paint yet. Super cute! I’m featuring your goodies in the PoPP Spotlight this weekend. Thanks for sharing with us. This is such and AMAZING project! Thanks so much for sharing with our readers at the spray paint link party! I love chalkboard paint. I’ve been planning to paint a wall in my kitchen to use as a menu, but I really love this idea. Thanks for the freebie! 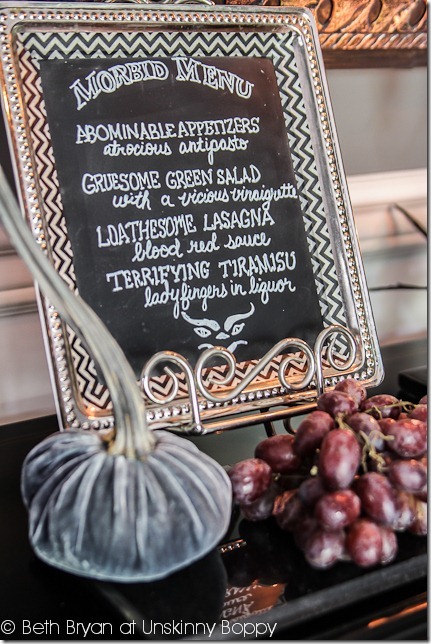 I love this project and the names on the menu are just to cute (spooky). What fabulous tips and ideas! I love your menu, hysterical, and the TURN BACK NOW! is so much Fun! Thank you for the tutorial, tips and awesome inspirations! Such a cute post! I am new to your blog, but I started smiling when I read your profile at the top of the page. I found you on Tablescape Thursday, and I am a new follower! Looks great! nice job on the entire party! Awesome! One question: does the wet erase erase cleanly, or did you have to refinish the chalkboard with another coat? I’m wary of using it on painted chalkboard surfaces after reading the chalk markers will permanently stain if it isn’t “real” chalkboard. Love it! 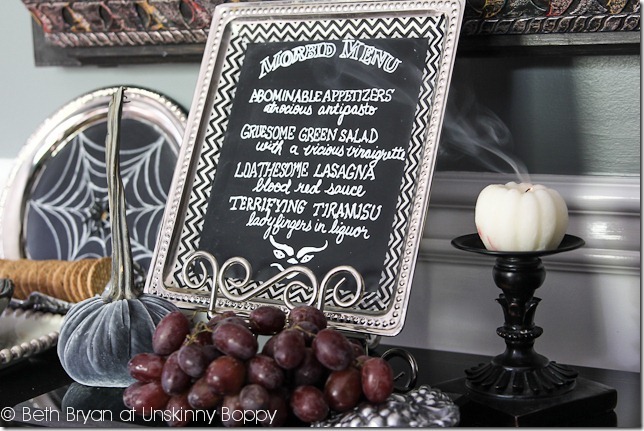 Stumbled upon your blog when I was trying to find some chalkboard art for my Halloween Mantel! to perform effectively when as compared to a tabulation viewed. was her older sister Lisa yet when he had a more clear view, it wasn’t.